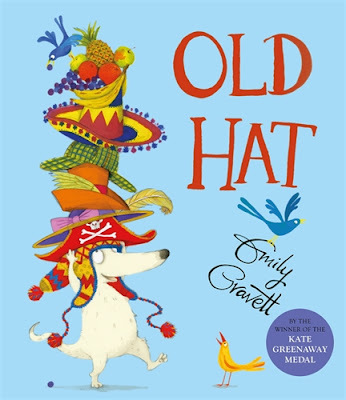 Old Hat is a children’s picture book written and illustrated by Emily Gravett and published by Two Hoots, an imprint of PanMacmillan (2018.) RRP: $Au 14.99 PB . Harbet likes his comfy knitted hat, but the others keep jeering at him - OLD HAT! OLD HAT! No matter what headwear he buys - be it a towering fruit platter hat, an old-boot-on-the-head hat or a brightly lit traffic cone hat, Harbet cannot keep up with the latest fashions. As soon as he gets a brand new hat it is already... OLD HAT! It seems that Harbet will never fit in. But when one day he decides to go his own way, Harbet discovers just how much more fun it is to stop following others and think for yourself. There’s a great message in Old Hat. I think some kids will feel compassion for Harbet, who is teased constantly about his hat not being up-to-date enough. Harbet tries and tries but no sooner does he copy the latest style than a new style pops up and he is once again “old hat”! Children will definitely appreciate the visual humour - Gravett’s colourful hats are superb - and the textual humour is lots of fun too. We read about one hat that is “low in fat, high in fibre, and could provide 80% of his daily vitamins.” But when Harbet thinks for himself and creates a feathery hat of his very own, suddenly his “friends” want to copy him. The final spread is very silly and very cute. Old Hat would be good to compare with other books about hats. Consider traditional tales like Caps for Sale, or picture books like We Found a Hat, Feathers for Phoebe, and NSS 2016 title, I Got this Hat. You'll find lots of hat activities in that last article. Can kids recognise the expression “old hat”? What does it mean? We call an expression like this an idiom. Do kids know any others? (It cost an arm and a leg. You can talk until you’re blue in the face. He’ll be there until the cows come home.) Make a class list of idioms and add to them over time.